The winter is officially over as the area teams showcased their final performances of the season this past week. Southington’s Chase Galayda and Innovation’s Kelsey Walicki not only did just that, but turned in a number of quality performances throughout the season. The Southington boys swimming and diving team competed in Class LL finals and the State Open where Galayda once again impressed. Galayda finished eighth overall in Class LL in diving last Tuesday with a score of 409.40 the highest anyone has ever finished during head coach’s Evan Tuttle’s tenure at Southington. The junior also broke a 28-year-old school record, originally set in 1990 for the six-dive format. Galayda’s score was good enough for him to advance to the State Open meet, which was held on Saturday, at Yale University. There, Galayda finished 11th overall in the state with a score of 428.00. But perhaps what’s most interesting about Galayda is just three years ago he had never stepped foot on a diving board. When Tuttle met Galayda in physics class, his freshman year, Galayda was wearing a gymnastics t-shirt. Diving is a strong point for the Blue Knights, but what is unique, is Southington doesn’t have a diving board at its home pool. That coach is Jan Zagorski, who has been the core of Southington’s dive team. Diving has always been Southington’s “bright spot,” scoring extra points for the swim team. In a couple of instances, the divers have even given the Blue Knights the lead. Galayda was no small part in that. Innovation finished out its regular season 8-11, securing the 28th seed in the Class S state tournament, which was just the second playoff berth in program’s history. This after starting the season 2-8. Along the way, Walicki played a key role, primarily as a shooter. What was perhaps most impressive about Walicki’s season was this was her first and only year of playing high school basketball. Initially just a soccer player, Walicki decided she wanted to try something new her final year of high school and as the season went on both her and her coach saw a good amount of improvement in her game. And while the Innovation girls basketball program is on the rise, Walicki’s presence on the court will certainly be missed next season. 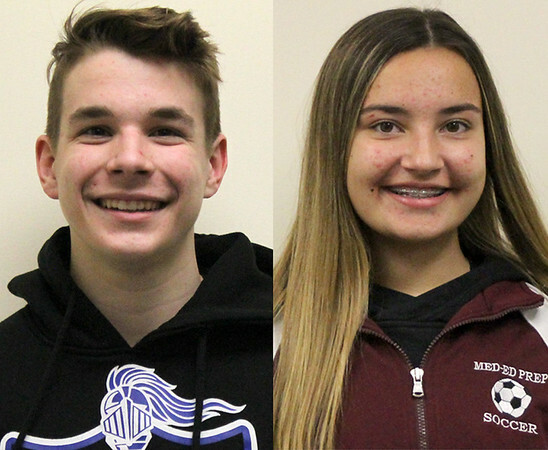 Posted in New Britain Herald, Athletes of the Week, Innovation, Southington on Monday, 19 March 2018 21:03. Updated: Monday, 19 March 2018 21:05.